Damp, grassy habitats, especially western. The adult is far less often seen than its familiar caterpillar. Nor does it eat or drink at all. 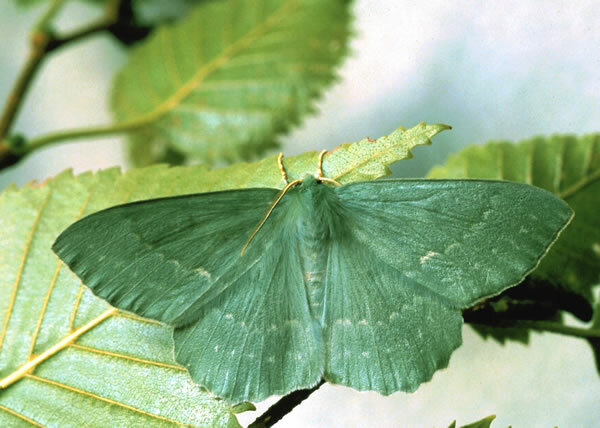 A beautiful emerald green when fresh, this spectacular moth occasionally flies by day but more often comes to light. The bold and simple patterns make this moth easy to recognise. 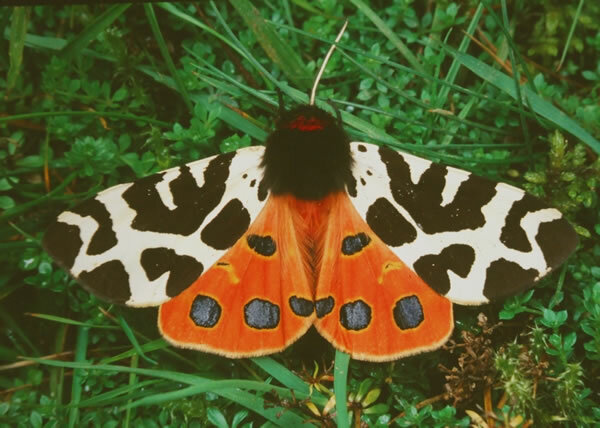 The largest of the tiger moths, still common with us but increasingly scarce in England. This abundant species is well-camouflaged in its heathery habitat. It sometimes flies by day. Woodland, marshes, most habitats with bedstraw. 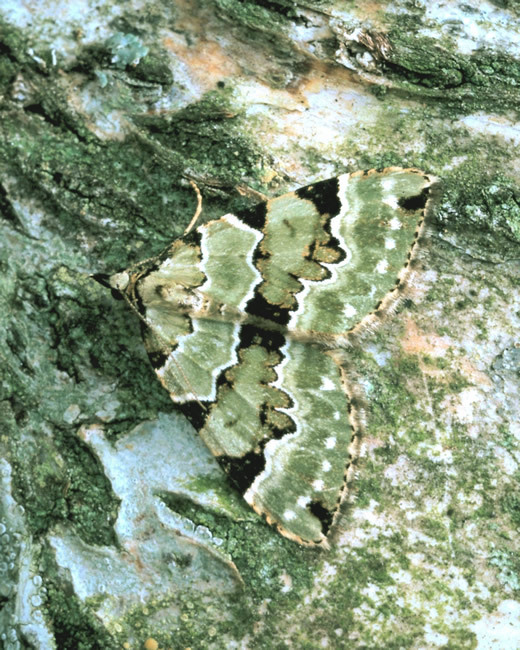 When newly emerged this moth is an attractive apple-green, but the colour soon fades to yellowish white. 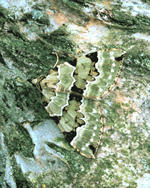 The black triangles along the leading edge of the forewing help camouflage by disrupting the moth's shape. Gardens, allotments, woodland edge, also heather moorland. 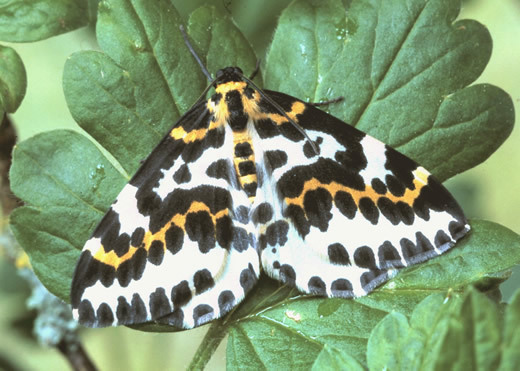 Few of our geometrids are warningly coloured, but Magpie Moth is an obvious exception. It sits exposed on foliage, protected from most predators by its garish pattern. Even so, it has declined dramatically in recent decades, especially in urban areas, though huge numbers still occur on heather moorland in north-west Scotland. 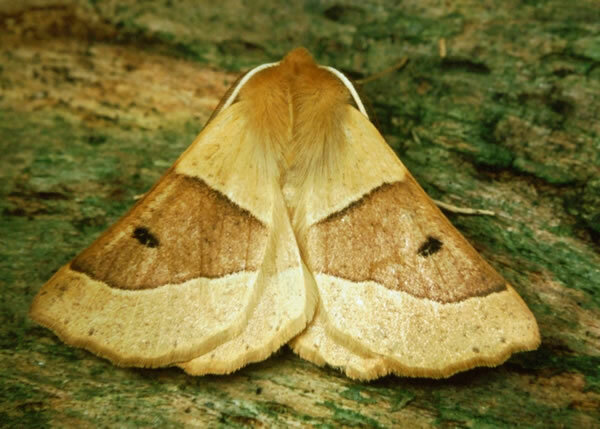 While the English name of this moth is a slight exaggeration, its scientific one (which translates as brown) scarcely does it justice, as this particularly bright and fresh individual shows. 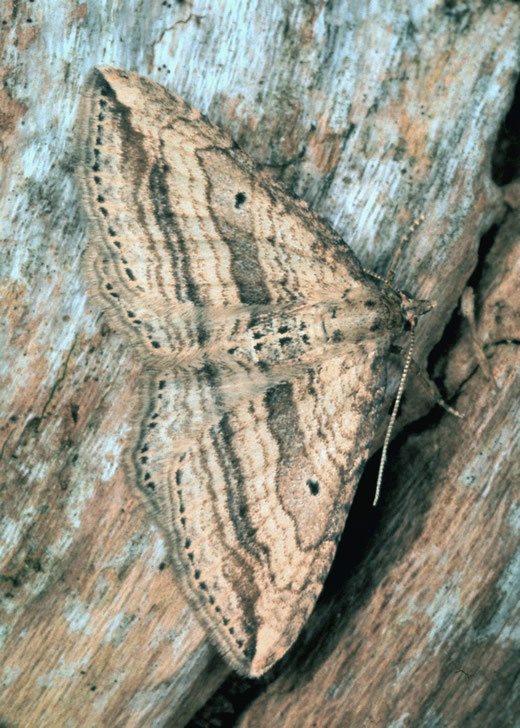 Though a common moth, it hides by day in ground cover and like others in its group is hardly ever seen except at light or sugar. This large and distinctive member of the Prominent family is renowned for its resemblance to a freshly broken bit of twig. Mated pairs remain together throughout the following day, trusting in their camouflage. Sharp eyes as well as luck are required to spot them. Most deciduous trees can be used used as foodplant by this common geometrid. 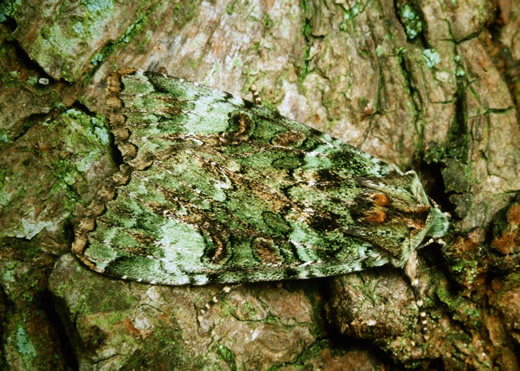 The delicate blue-green adult rests by day amongst the foliage, usually on the underside of the leaves. 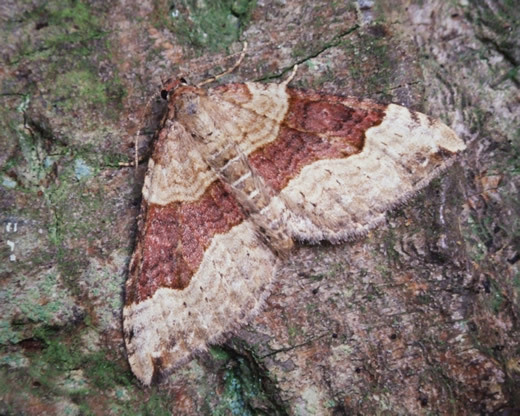 Most moths in this subfamily are some shade of brown, but this species is a pleasing exception. Though widespread, it is never particularly numerous, so fresh and unfaded specimens are always a welcome sight. They look particularly stunning when seen by torchlight while feeding at sugar. 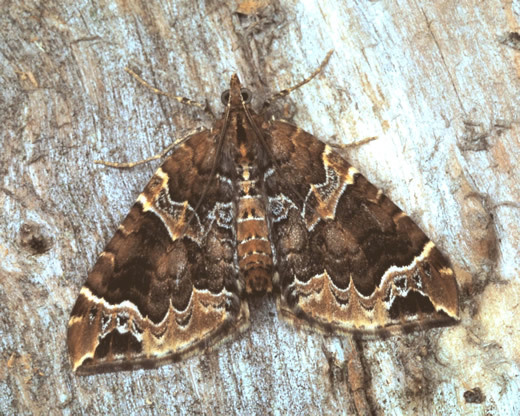 This huge and rather primitive wood-boring moth was recently declared a BAP species because of its long-term British decline. Despite much apparently suitable habitat, only three occupied areas are currently known in Highland, where birch seems to be its tree of choice. 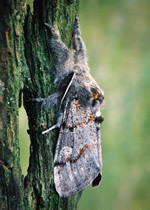 Though it is most easily recorded in the larval stage, adults are occasionally found at rest on tree trunks, looking like a projecting snag or shard of bark. Moorland and other upland open habitats. The English name of Red Carpet is a slight exaggeration. It is similar is size and general appearance to various related species. In this example the central band is reddish, but often it is a dull purplish-brown. Like most of its kind, the adult is easily disturbed into flight by day. Waste ground, roadsides, woodland edge - anywhere with nettles. 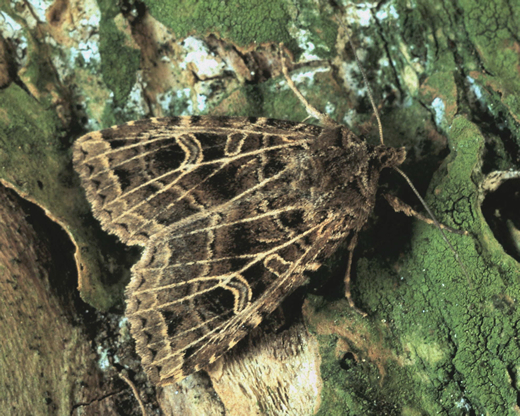 The long palps of this moth give rise to both the English and scientific name. Its shape is equally distinctive: nearly a perfect equilateral triangle. It can be disturbed from almost any sizeable patch of nettles, usually causing it to fly deeper into the clump. Most are a darker and duller shade of brown than the example illustrated. This is the one pug everybody can identify. Rather than hide, it mimics a bird dropping, resting openly on leaves or stems. The caterpillar often feeds on ragwort flowers. In our area it is found along the Moray Firth and on the machair of the Outer Hebrides, but apparently not elsewhere on the west coast - a rather strange distribution. This is a very local moth in Britain, largely confined to extensive east coast sand dunes where its sole foodplant, lyme-grass, grows. Its caterpillar lives internally in the lower stems and roots. In our area there is a strong colony at Nairn. Though plain and drab, the adults are perfectly camouflaged when resting on the old leaves and stems. This strange little day-flying moth is found on stony ridges and summit plateaux above the 800 metre mark. Its caterpillars feed on crowberry and the life cycle takes two years in this harsh environment. Moths fly only in sunshine. They are more numerous in odd-numbered years (such as 2011), perhaps because of some complex interaction with their parasitoids. 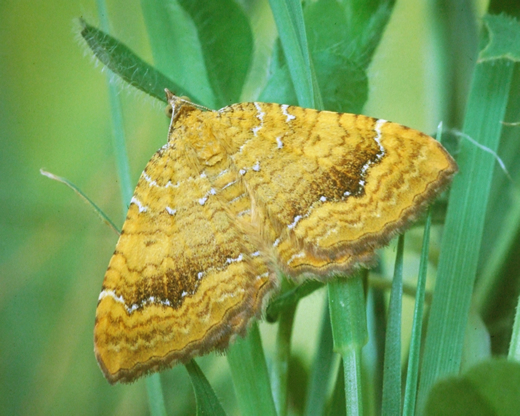 During the past decade this attractive species has greatly expanded its distribution in Scotland and increased in numbers, apparently at the expense of its close relative, Gold Spot. 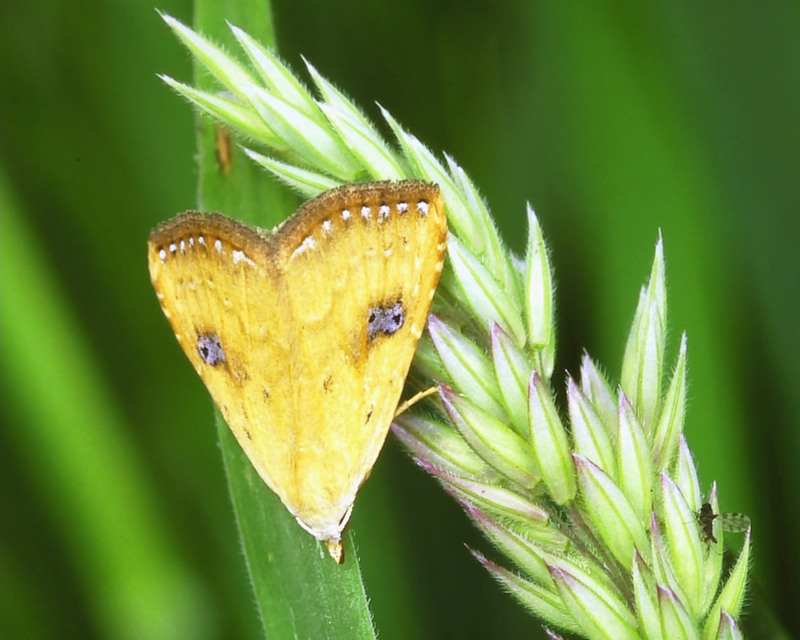 Both species share a similar habitat, with their caterpillars feeding on grasses and sedges, so may be in direct competition with each other. The adults are strongly attracted to flowers at dusk, including garden buddleia. By day they rest head-downwards on vegetation. Gardens, marshes, damp weedy places. Widespread but never numerous, the Gothic is probaby commoner in gardens than in any other habitat. Its caterpillars feed on many different low plants and shrubs, communally at first. 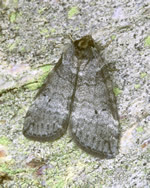 The broad-winged, rather skulking adult is not strongly attracted to light traps and seems to be relatively inactive. It hides by day and at night occasionally visits sugar or flowers. Upland and inland grass moorland. Beyond that its caterpillar feeds on the lower stems and roots of grasses, we know very little about the ecology of Northern Arches. The NMRS distribution map shows it to be widespread throughout most of mainland Scotland, though apparently absent from the Western Isles. Yet nowhere is it numerous. This makes it one of the hardest Scottish specialities to find: it can turn up almost anywhere, yet no site is guaranteed to bring success. 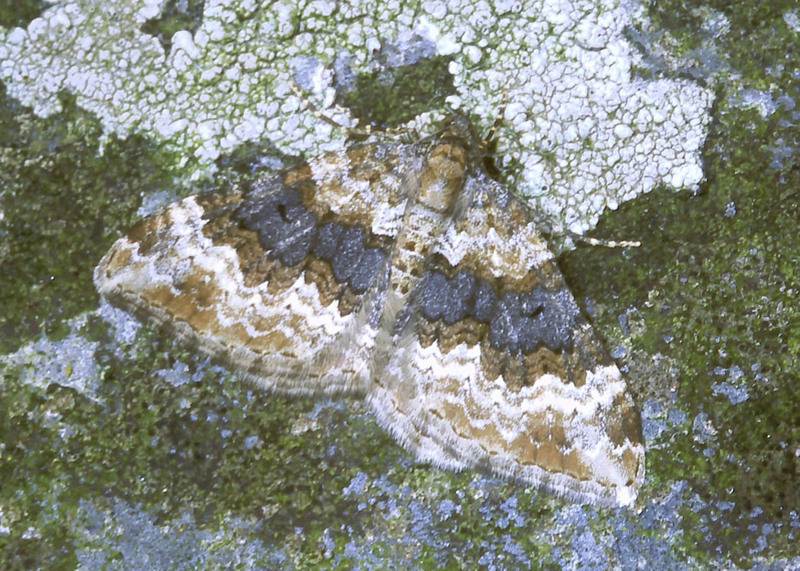 Although widespread in our area, Oblique Carpet is very local and seldom numerous. Marsh bedstraw is the foodplant but the moth is often absent from apparently ideal habitat. Like other carpets it takes flight when disturbed, but sightings are infrequent. Elsewhere in Britain there is some evidence that this species is declining and that may also be the case in the Highlands. Northern Dart is confined to mountain summits in Scotland, usually at an altitude beyond 800m asl. In this harsh environment it is unsurprising that the life cycle takes two years, mostly spent as a caterpillar feeding on crowberry. Curiously (as with Black Mountain Moth) adults are far more numerous in alternate years. This is thought to be due to an interaction with parasitic wasps. Over most of the Highlands moths are out in even-numbered years, though odd-numbered years in West Ross. Due to the logistical difficulties of transporting light traps and generators to suitable sites, many records are of larvae or pupae. It is likely that the distribution map for this species is incomplete, but even so it does appear to be fairly local. The British subspecies alpina is more brightly coloured and strongly marked than the duller nominate form. 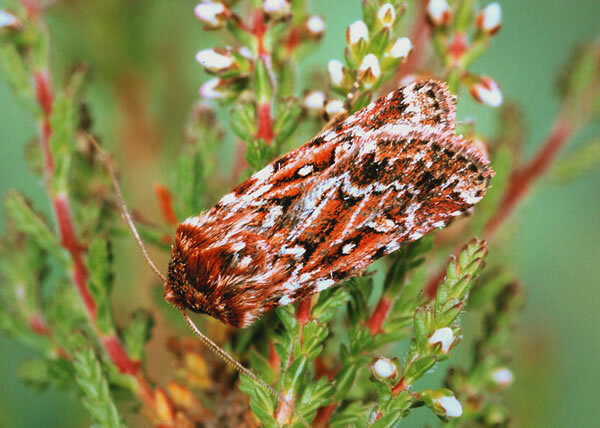 In the Highlands, Dark Tussock is very much an eastern species, found there on almost any patch of heather moorland. Yet it is totally absent from similar habitat in the west. This distribution corresponds well with an annual rainfall of below 60 inches per year. Its caterpillar feeds mainly on heather and has a two-year life cycle in our area, hibernating twice. Two distinct size groups are apparent in spring. Adults are occasionally found at rest by day, with their surprisingly long and furry forelegs extended, but are most often seen at light. 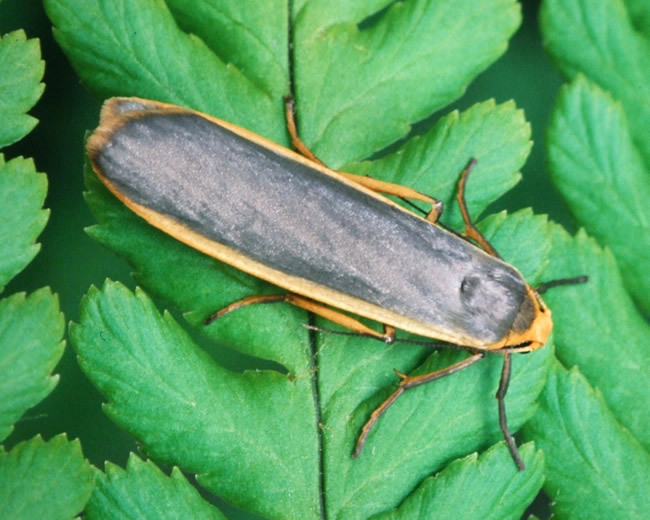 Common Footman reaches the northern limit of its British range in our area. However, instead of petering out gradually, it has a strong population around the Black Isle and inner Moray Firth, well separated from its nearest neighbours. No doubt the low rainfall and increased sunshine of this classic rain-shadow area is the explanation. Like others in this subfamily, its caterpillar feeds on lichens, particularly those growing in full sun on rocks, dykes and fence posts. Most hairy caterpillars need to bask. 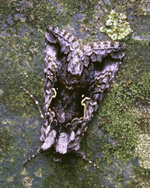 The adult rests in foliage by day and can sometimes be seen on flowers, particularly thistle heads, at dusk. Open grassy habitats, particularly coastal ones. Though found almost everywhere, Yellow Shell prefers neutral or basic well-drained soils and is scarce in damp acidic moorland. It can be particularly numerous on the coast. The caterpillar feeds from autumn to spring on various low herbs such as chickweed and bedstraws, but is not often seen because of its nocturnal habits. 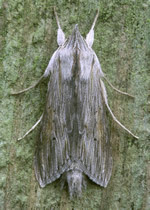 In contrast, the adult moth is mainly crepuscular and rarely caught in light traps. It is readily disturbed by day, flying a short distance before settling again on low vegetation or sometimes rocks. At dusk after a hot day, many can often be found nectaring on ragwort flowerheads. Gardens, arable farmland, weedy waste ground, coastal habitats. This is very much a garden moth, even found in urban areas, and perhaps more numerous there than in the open countryside. 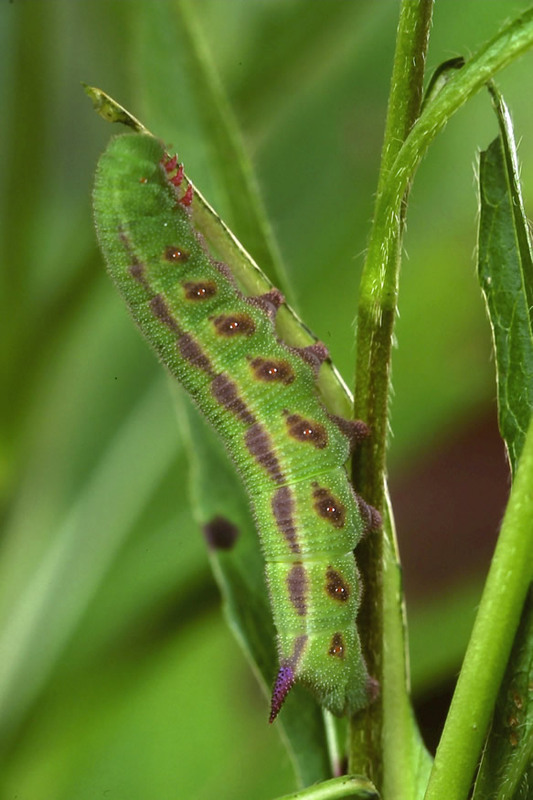 Its caterpillar feeds on many herbaceous plants both native and exotic, being an occasional pest of tomatoes. Winter is spent as a pupa in the soil. Like many species that have two broods further south, in our area there is just one extended generation; only in a really good summer is there a small second brood. By day the adult hides away and is rarely found. At night it visits nectar sources and comes to light. Late June to late August in one extended brood. Most habitats, particularly open ones. This moth is a bird-dropping mimic, though it is uncertain whether predators are fooled or merely put off by the distasteful association. As in other such mimics, the colour pattern includes irridescent blue to suggest a still-wet dropping. Almost certainly this blue is produced structurally (Tyndall blue?) rather than by a pigment. Though never particularly numerous, Purple Bar is generally distributed, as are its foodplants, various bedstraws. Its life cycle is very unusual for a geometrid: the caterpillar reaches full growth in autumn and constructs a sturdy earthen cocoon, but does not pupate until the spring. Though mainly active at night, the adult can sometimes be disturbed by day or seen openly at rest on vegetation. 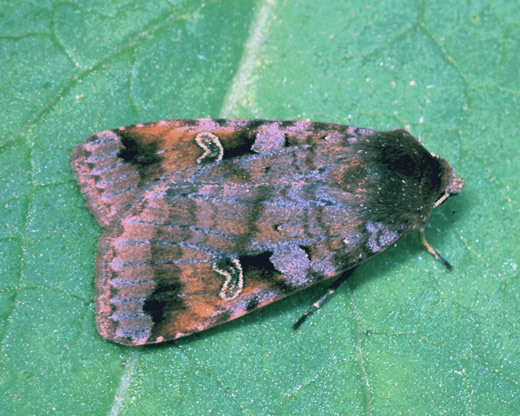 Generations of lepidopterists have cursed the similarity of the vernacular names used by South for this species and L. oleracea, yet attempts to amend them have failed. Admittedly, 'Orange Wainscot' for the present species did not quite hit the mark, its usual colour being a tawny or rusty brown. In the northern half of Scotland this is very much an eastern species, virtually absent from the wetter west. Even in the east there is some association with drier rocky areas such as coastal cliffs or quarries. As with all the species in its genus, grasses are the larval foodplant, with the caterpillar feeding slowly through the winter then growing rapidly in spring. 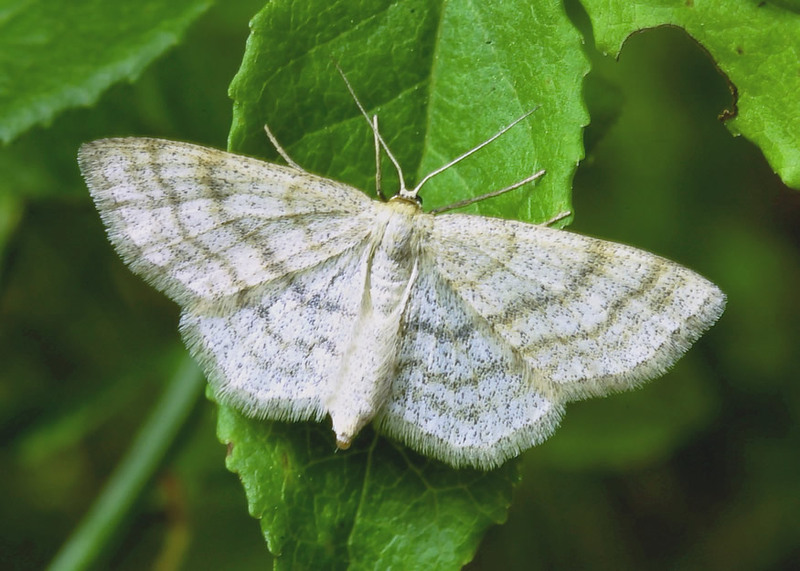 In our area this moth seems less common than it used to be, an impression backed up by the number of 10km squares with no recent record on the NMRS Atlas map. 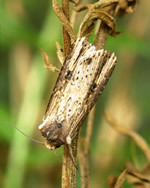 The adult is hardly ever found by day, but can be seen on ragwort flowerheads after dark or trapped at light. Woodland edge, arable farmland, road verges, wasteland, sometimes gardens. 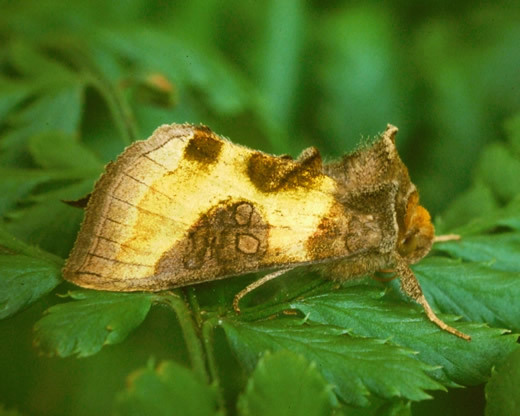 Few moths are more aptly named than Burnished Brass. 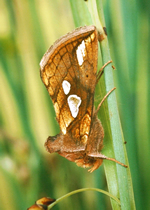 Most of the forewing is covered with metallic scales that reflect the light at certain angles but appear dull from others. The purpose of this colouration, shared with most of the Plusiinae, is uncertain. 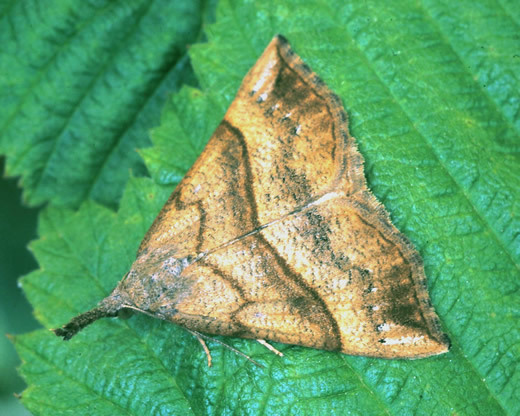 The adult often rests exposed on the upper surface of a leaf (I found my first on coltsfoot) but whether the effect is cryptic or merely confusing is unclear. This is another species that is double-brooded in the south but has just one extended brood in our area. Its caterpillar feeds mainly on nettles, so does not lack for foodplant, especially on farmland where the soil is enriched by organic waste. It also benefits from nettle patches left in gardens supposedly for Small Tortoiseshells and other vanessid butterflies, which rarely use them. At dusk the adult is an avid feeder at campions and other nectar sources, hovering in front of the flower. The waves Sterrhinae are a mainly southern subfamily. Smoky Wave is an exception, being widespread in the Highlands, particularly in the west. It can be abundant on sheltered moorland and in open woodland with a bilberry ground layer, a main foodplant of its caterpillar. The adults are partly diurnal and easily disturbed from the heather, particularly in warm dry weather. The female (illustrated) tends to be smaller than the male, with more pointed forewings and stronger crosslines. She has less of the grey freckling that gives the species its vernacular name. June into August, peaking in July. 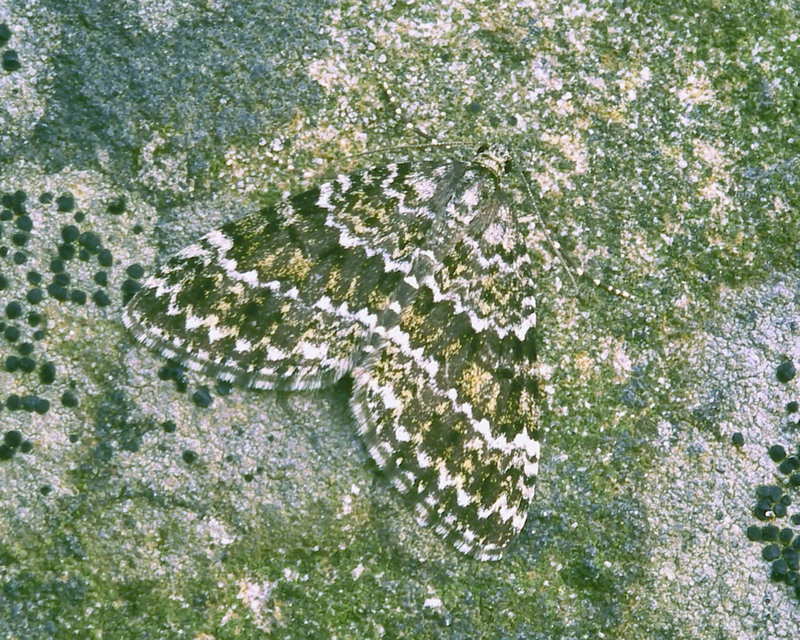 This dull and obscurely marked moth causes problems for beginners, who frequently mistake it for one of the carpet subfamily. The twin discal spots are the best distinguishing feature. 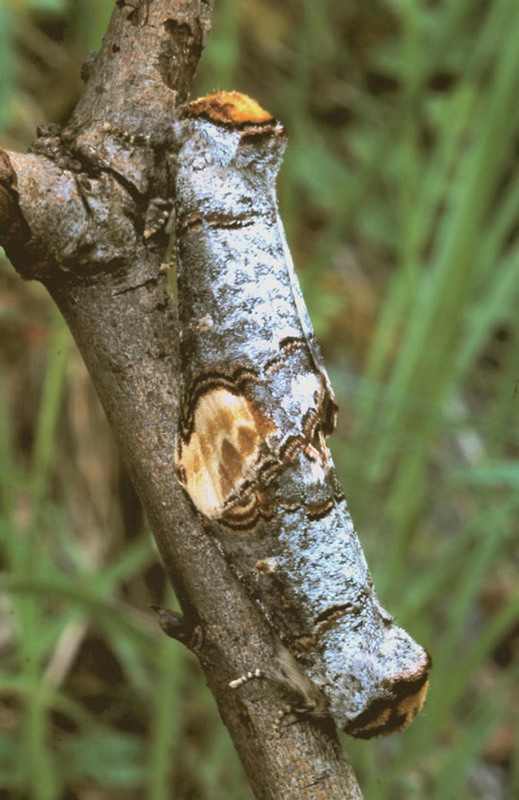 The moth can found almost everywhere there is birch, perhaps most easily in the larval stage. The caterpillar spot-welds two leaves together with blobs of silk, forming a retreat for concealment and feeding only at night. The adult can either rest flat on trunks as illustrated, or furl its wings around a slender twig. At night it comes to light and also to sugar. Woodland, scrub, moorland - almost everywhere. 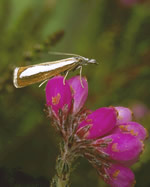 This ubiquitous species is one of our most variable moths, particularly in the Highlands. The forewings may be light or dark, plain or variegated - yellowish, ochreous, orange brown, lilac or grey, reddish brown or maroon. Some moths have a strong blueish suffusion, a particularly attractive combination. The markings also vary both in colour and intensity. The distinctive square black patch between the stigmata, shown here, is often absent. Even size and shape are variable, moths from upland heather populations being noticeably smaller than those from lower woodland. Despite its abundance, Ingrailed Clay can easily be overlooked. By day, the adults conceal themselves in low herbage and are hardly ever found. The caterpillar feeds nocturnally on a wide variety of low plants and shrubs and also hides away by day. Only light trapping or sugaring reveals the true numbers present. Late June to September, peaking in July. Hedgerows, marshes, road verges, farmland. Bedstraws are a frequent foodplant of the carpet subfamily. Barred Straw prefers the taller species such as cleavers, so it is mainly found in richer, lowland areas including arable farmland. Thus in the Highlands it is common in the east but increasingly scarcer and more local towards the north-west. The adult's unique resting posture is its most distinctive feature. The forewings are held raised, which would normally expose the hindwings. Instead, these too are raised, so neatly tucked away behind the forewings that they appear to be missing completely. 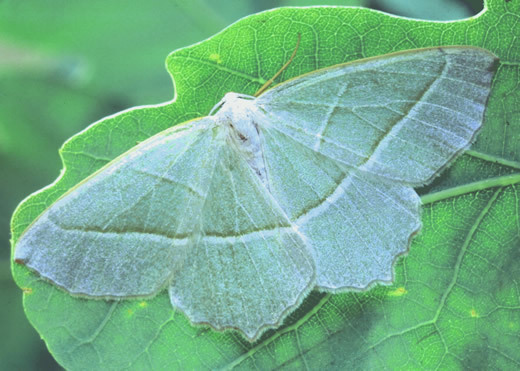 Such an unusual shape perhaps misleads predators, resembling a yellowing leaf when the moth rests amongst tangled low vegetation. Light Arches is a close relative of Dark Arches (see August) but much less abundant. It prefers drier grassland on lower ground, where its caterpillar feeds on the roots and lower stems of grasses. 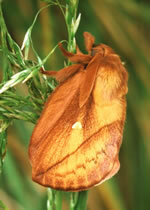 In our area it is mainly an eastern or coastal moth. The waves Sterrhinae are a mainly southern subfamily, with relatively few species found in Scotland. 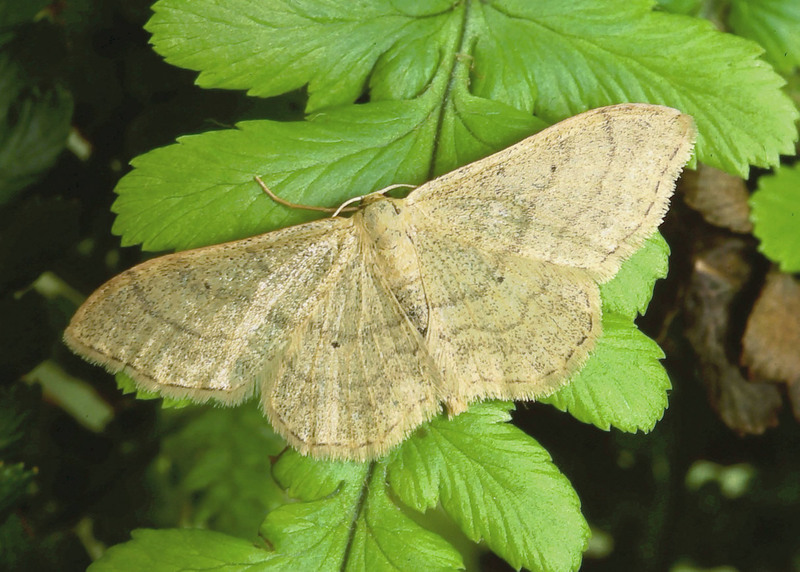 Riband Wave, however, is present almost everywhere, but in its plain form remutata. 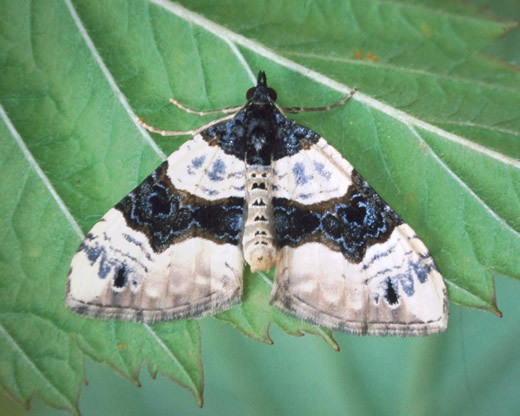 The dark-banded typical form that gave the species its English name is scarce or absent here. For such a common moth, the caterpillar is rarely found in the wild. Like most species in this genus, it is believed to feed on withered leaves of a very wide range of plants and trees, on or near the ground. The adult rests amongst vegetation, often sitting openly on the upper surface of a leaf, yet to our eyes it does not appear to be either cryptically or warningly coloured. After dark the adult feeds at nectar sources such as ragwort and sometimes comes to lighted windows. June into August, sometimes earlier or later. This moth is one of our most abundant and ubiquitous species, found from the coast almost to the mountain summits. It is mainly crepuscular, but readily disturbed by day, making it simple to record even on brief casual visits to an area. The caterpillar is polyphagous on 'low plants' including bedstraws. It is believed to hide at ground level during the day, which would explain why so few are found in the wild despite the high numbers of adults. 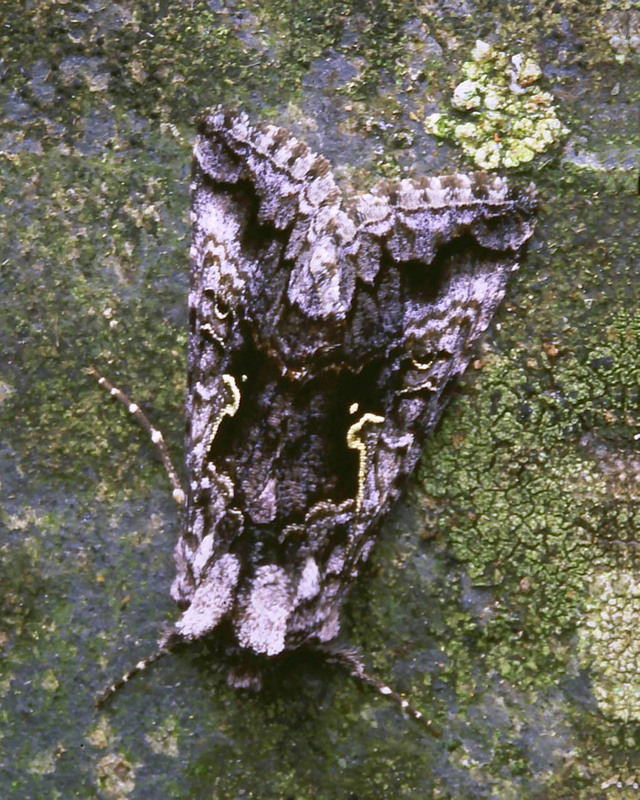 The adult rests amongst low vegetation or occasionally on a tree trunk, where It is often conspicuous despite some vague resemblance to a bird dropping. Perhaps it is not particularly palatable to birds. At dusk, adults can often be seen flying in numbers that are not reflected in subsequent light trap catches, which may be just as well. June & July, sometimes later. Arable farmland, road verges, brownfield sites. Shark is a member of a very large genus of confusingly similar moths that are often easier to separate in the larval stage. In Europe there are about 60 species, but only half a dozen are resident in Britain and just two in Scotland. 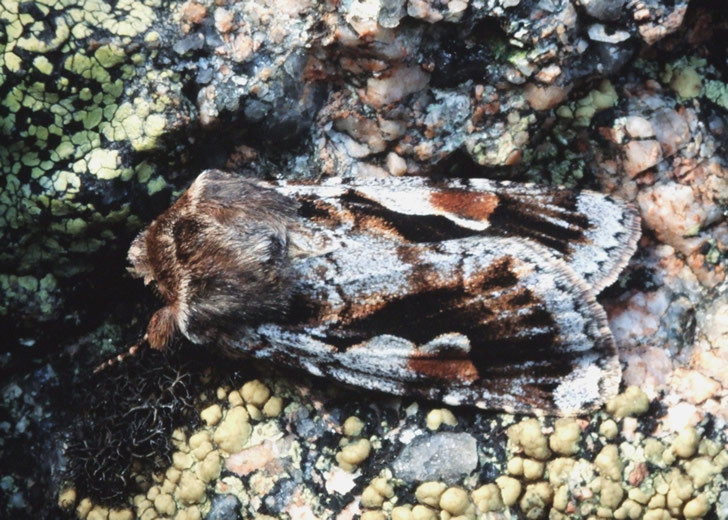 In the Highlands, Shark is a widespread but low density moth mainly found in lowland areas, particularly where there is arable farmland. Its caterpillar feeds at night on sow-thistles, hawkweeds and related species that are frequent on disturbed land or as weeds around field edges. By day the adult rests on the fence posts around such fields, well-camouflaged as a sliver of weathered wood. 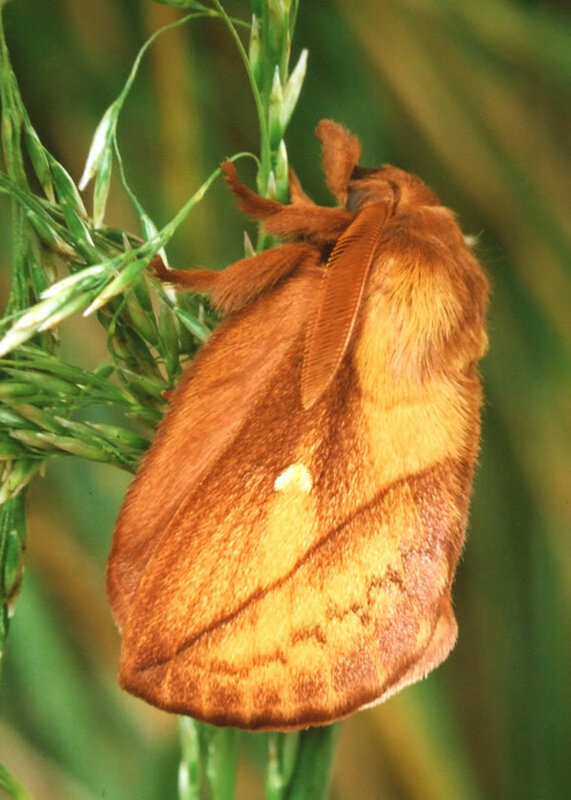 The moth becomes active at dusk, when it is strongly attracted to nectar sources. To match its long legs it has a long proboscis too, making it one of the few noctuids able to feed at honeysuckle flowers. At high summer it can sometimes be seen hovering at the blooms in the gloaming, looking rather like a minature hawk-moth. Many years ago I saw a Shark taken by a bat while engaged in this activity. Grey Mountain Carpet was once found in abundance on almost any heather moorland, but in the last twenty years it has undergone a decline. 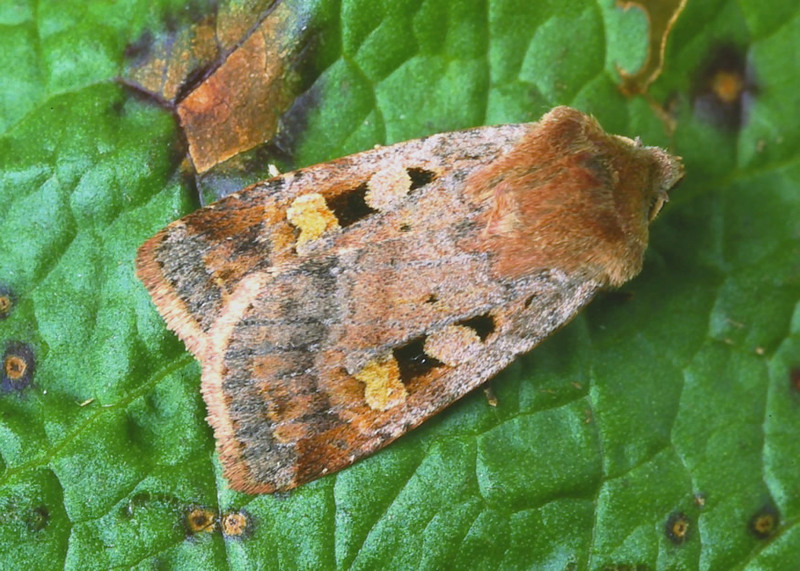 Data from the National Moth Recording Scheme reveal a retreat from coastal areas and lower ground, with no records from many former sites since 2000 (see BC East Scotland Branch website). Now the population appears to be concentrated on the higher ground of the central Highlands, where the moth is still common. Similar losses from more marginal sites have been noticed elsewhere in Europe, for example Finland. In Scotland at least, habitat deterioration does not seem to be a factor in the decline. Heather is the main foodplant, and the caterpillars are beautifully camouflaged when feeding on the sprigs. This may protect them from birds but not from parasitoids - only one of the ten larvae I took home last year had not been attacked. 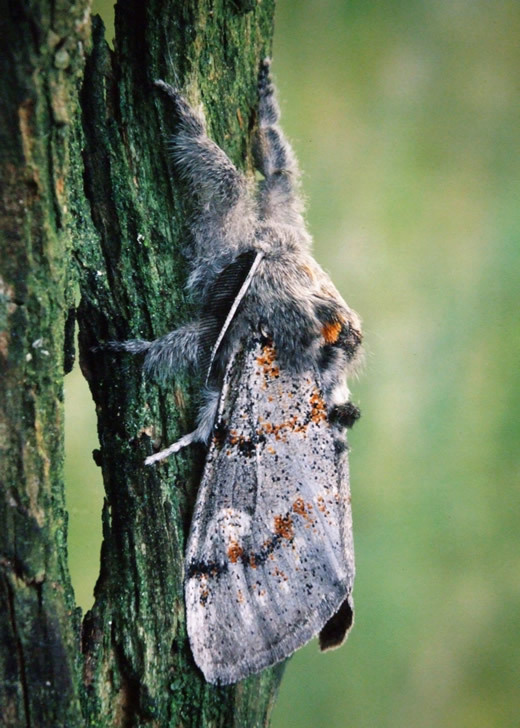 Perhaps climate change has somehow altered the balance between the moth and its enemies. Adults prefer to rest on exposed rock faces if these are available. Their camouflage is excellent. Many times I have scanned a slab of rock and failed to spot a single moth, only for several to take flight when I tapped it with a stick. 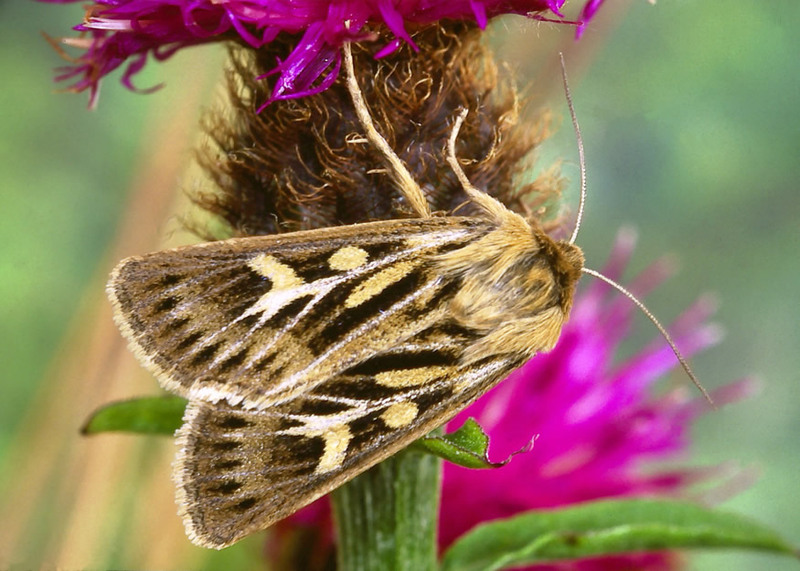 Antler Moth is one of our most ubiquitous and abundant Scottish species, both on the mainland and the outlying islands. Historically it has been responsible for serious damage to upland pastures during immense population explosions, with larvae so abundant that they clogged up drainage ditches after a heavy shower. 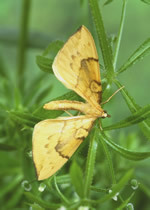 Such outbreaks were always highly localised and have become less frequent nowadays, though the moth is still very common in suitable habitat. The adults fly both in the daytime (especially early morning) and at night. They may sometimes be seen nectaring by day on ragwort flowerheads. After dark, both sexes are strongly attracted to light, but they are curiously rare at sugar. As an occasional agricultural pest, the life cycle of Antler Moth has been studied. It was found that hatching success was greatest if the eggs were kept frozen in ice over the winter. Plain Wave is a widespread but local species that is rarely seen in numbers. Its characteristic habitat is open woodland (whether deciduous or coniferous) with a good ground layer of bilberry. The Great Glen, Speyside and Deeside are clearly picked out on its distribution map. As its name suggests, this is not a strongly marked species even for its subfamily. 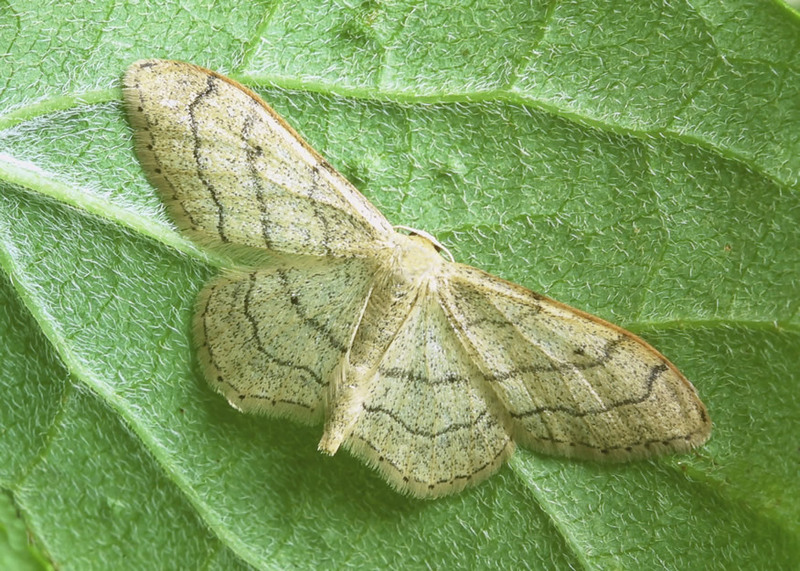 It is best distinguished from the rather similar Riband Wave (see July 2015) by its satin texture and the absence of marginal dots. Unlike the latter species, it is not usually present in gardens. This striking crambid ‘grass moth’ is easily recognised by the broad and unbroken pearly white streak on its forewing, although elsewhere in Europe there are several very similar species. It is readily disturbed by day, normally flying only a short distance before settling again on low vegetation with wings tightly furled in the characteristic resting posture of this group. Like others in the genus, its caterpillar is believed to feed on mosses, but there are few if any records of it being found in the wild. There are very few recent reports of this species in Scotland, and many (or most?) of the older records may well be misidentifications. It is a local and scarce moth of limestone and other basic rocks. In our area it is known from the Tomintoul district and the Banffshire coast, where the specimen figured was reared from a tiny caterpillar found on lady’s bedstraw collected as foodplant for a different species. It remains the only record for that site. 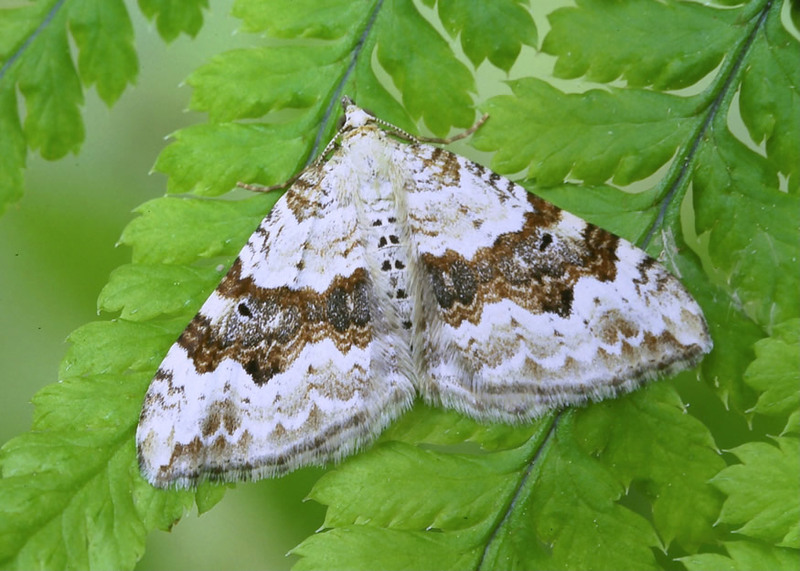 The adult can be distinguished from the related Common Carpet by the much broader central band, and the slightly concave leading edge to the forewing. 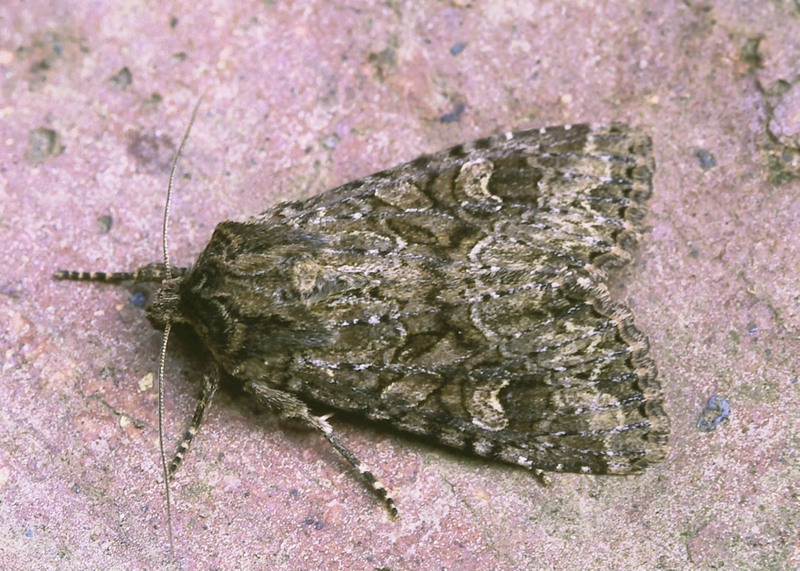 Like most other carpet moths it is easily disturbed by day in warm and sunny weather. Road verges, gardens, field edges. In the southern half of Scotland this is a common species of weedy low-lying ground, a familiar garden moth. In Highland it is local and scattered, with some records likely to be of migrants. 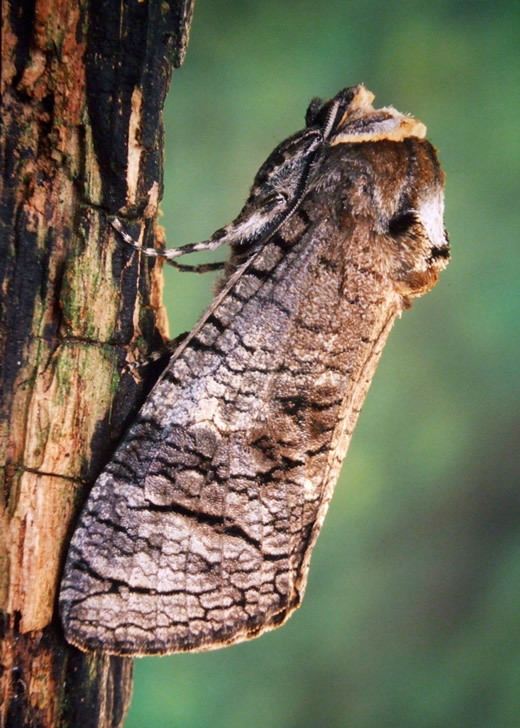 Unlike many other moths it shows no sign of any increase or spread in response to climate change. 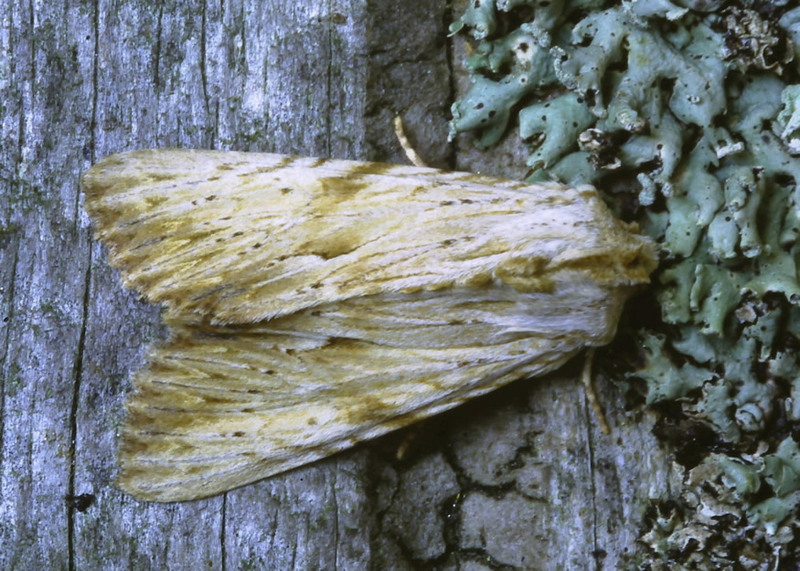 The scientific name likens the adult to a piece of old rotting wood, which it resembles when at rest with wings tightly wrapped around the body. 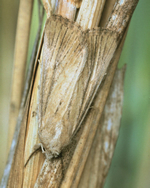 Red Sword-grass Xylena vetusta (see March)also adopts this strategy and its scientific name has a very similar meaning. 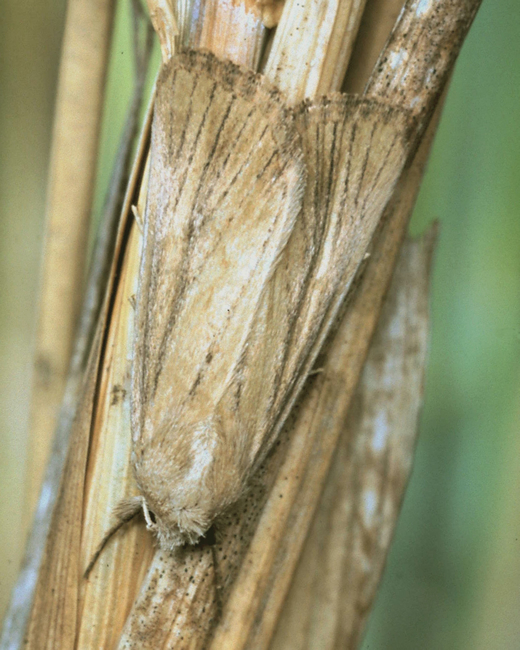 Smoky Wainscot is so abundant and ubiquitous that any blank squares in its distribution map can be assumed to represent under-recording rather than absence. With a caterpillar that feeds mainly on grasses and appears to have no obvious habitat requirements, it is equally at home in coastal sand dunes, farm pastures, bogs, marshes and high inland hills. There is only one brood a year but the flight period is long, from the beginning of July well into September in a cool summer. The adult rests low down in the sward by day and is rarely found. Unusually for an abundant species it shows little individual variation in colour or markings, as if it had perfected a general purpose disguise for hiding amongst grass tufts wherever they might be. The pale forewings make the adult conspicuous in flight at dusk, low over the grasses. After dark it often nectars on ragwort flowerheads and at rosebay willowherb. Woodland rides, marshes, ungrazed grassy places. 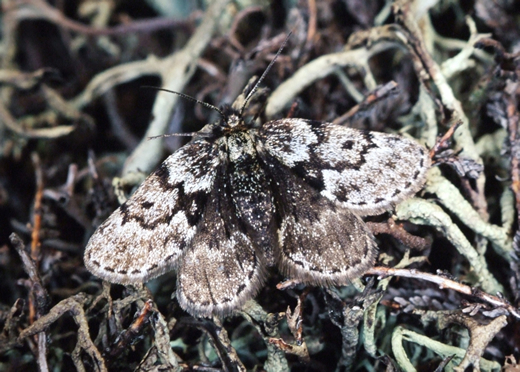 Once considered a noctuid, this distinctive little moth has now been placed in its own subfamily within the Erebidae, a highly diverse assemblage based on DNA relationships that is unlikely to pass the test of time. In our area, Straw Dot is most numerous in the west. It is a common sight where there are tall, rank grasses, the larval foodplants. The adult is active at night but also easily disturbed by day, when it flies a short distance before landing again, usually resting head-down on a grass stem. 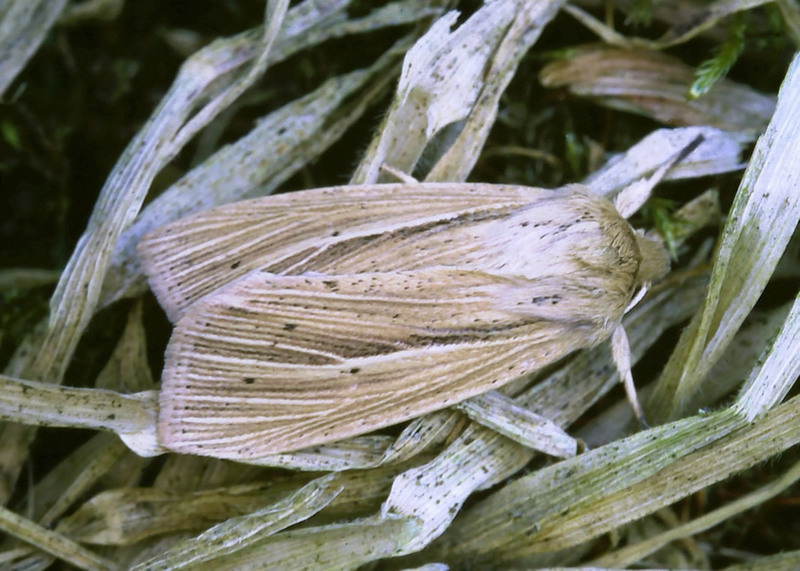 The buff or ochreous colour of freshly emerged examples soon bleaches to a whitish straw, giving the moth its vernacular name. In recent years Straw Dot has been extending its range eastwards, perhaps in response to milder winters, with the first Banffshire records coming in 2014. Caterpillar full-grown late July – early August. Damp hillsides, marshes, woodland rides. The caterpillar of Narrow-bordered Bee Hawk-moth is traditionally considered very hard to find, but sharp eyes and patience are all that’s needed at a known site. Although the caterpillar itself is very well-camouflaged, its distinctive six-lobed frass can give away its presence nearby. It is said that scabious with purple blotches on the leaves somehow triggers similar markings on the larva, which can otherwise be plain green. During its final instar the caterpillar grows very quickly, eating almost continuously by night and day. Presumably it is involved in a race against time, trying to reach a suitable size for pupation before it is found by one of its many predators and parasitoids. 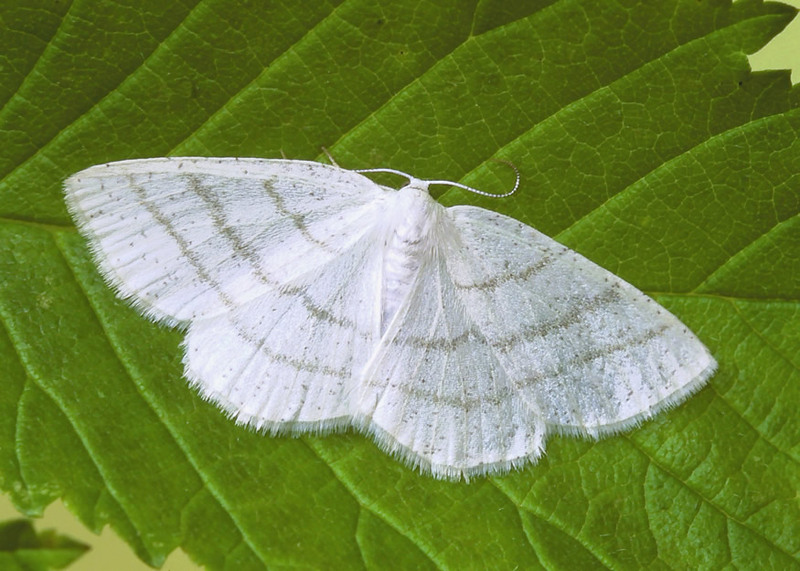 Few moths are quite so pure a silky white as Common White Wave. This can make it quite difficult to photograph accurately without a colour cast and with the correct exposure. Despite the long flight period there seems to be only one protracted brood, with emergence peaking in July. Its favourite trees are birch and alder, though it can use other broad-leaved species too. 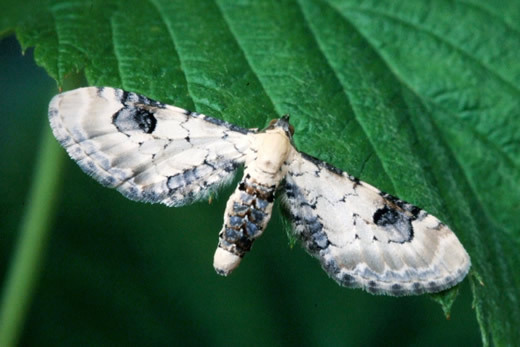 It rests by day amongst foliage, usually on the underside of a leaf, but is readily disturbed into conspicuous flight. This makes it an easy moth to record even on a daytime visit. As its name suggests, it is common wherever suitable habitat exists. 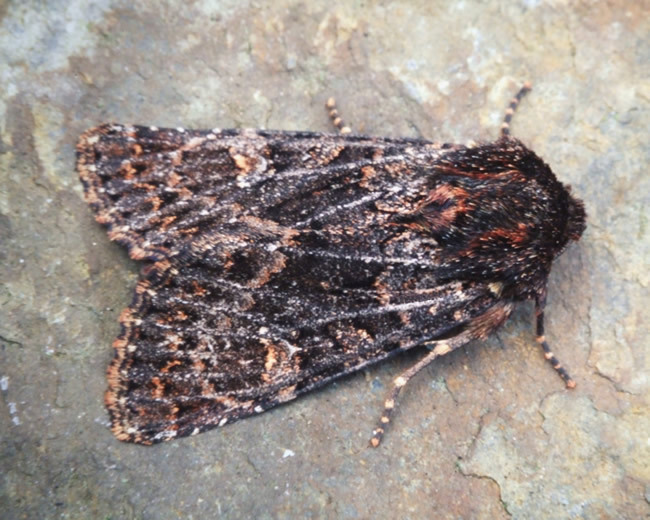 Most of our moths were given their English names by the old southern collectors, and to them Scarce Silver Y would indeed be a difficult species to obtain. Not so in the Scottish Highlands, where it may be found on almost any upland and inland heather moor, particularly where there is ample bilberry as foodplant. 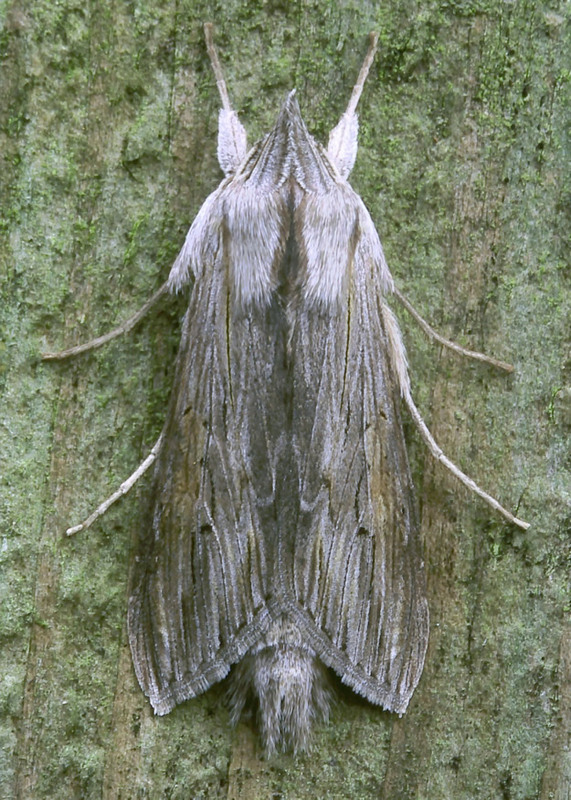 Even so, it is an attractive moth to discover, sometimes resting head downwards on a fence post or rock. 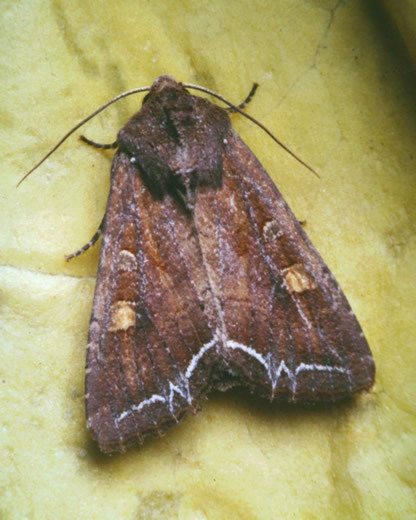 Unlike related species there is little if any brown tint in its colouration, even when the moth is worn. Instead it is various shades of grey, from almost black to silvery, usually with a violet or bluish tinge when fresh. The metallic y mark (actually golden) is variable in shape and often becomes a squiggle, or even the question-mark to which the scientific name refers. Mid June to mid August, peaking in July. 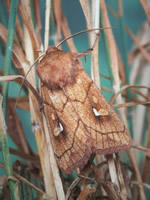 Dusky Brocade is the ultimate dull brown noctuid, frequently mistaken by beginners for at least half a dozen much scarcer species. It does not help that there are three different forms - plain, patterned and intermediate – which themselves vary to some extent. In our area, the plain form (illustrated) is the most numerous. Almost any sort of grassland, dry or damp, rural or urban, will support this species. Its caterpillar overwinters while small, then feeds up on the fresh shoots in the spring, when it is a frequent find by torchlight after dark. The adult is hardly ever seen by day, probably resting low down in the turf. 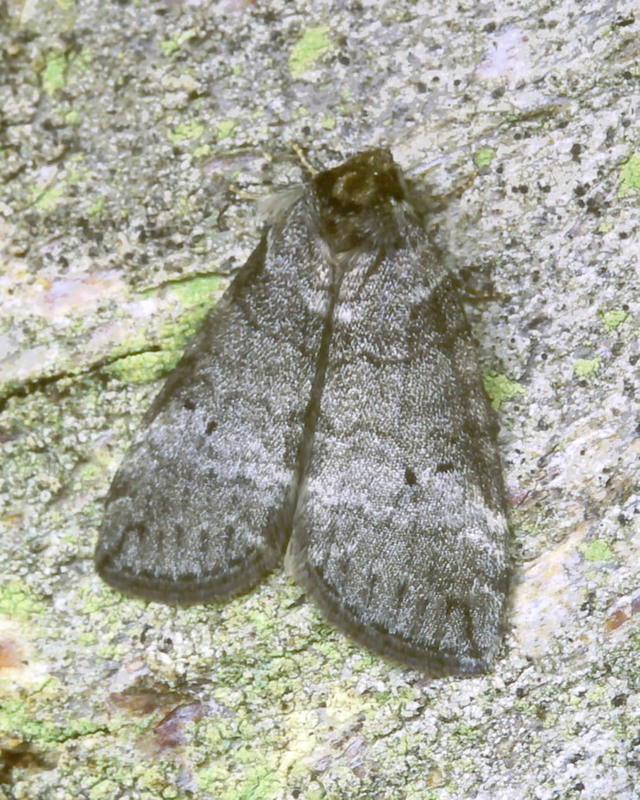 It is active after dark, when it can be very numerous at sugar and in light traps.